Hi, I have had my hermanns tortoise for the past 4 years and have never experienced any health problems however i have noticed that he is reluctant to open his eyes and when i can ease them open during batheing they seem white and dull with a small white protuding dot in the centre, i have looked all over and cannot find a diagnosis or treatment for this. The picture shown is him with his eye open when dry. Clearly you take good care of your pet. I can't tell you what caused this problem. 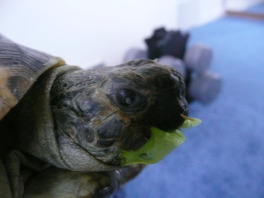 But I can tell you that eye problems are serious for a tortoise because the tortoise uses vision to find its food. The color doesn't sound good to me. I would see a vet as soon as possible. A reptile vet would be best, but any vet is better than no vet in a case like this. I wish you all the best.